Asphalt repair (potholes and damaged areas) is critical to protecting your asphalt investment. If these failing surfaces are not maintained, they will rapidly become larger problems leading to costly repairs that could have been easily prevented in the first place. Asphalt Pavement Solutions is the Philadelphia & Camden asphalt repair expert, serving New Jersey, Pennsylvania and Delaware. Damaged asphalt and pot holes do not happen overnight. From the moment asphalt is installed the deterioration process begins. There are many factors which cause this deterioration and that can make asphalt repair necessary. The suns ultraviolet rays bake the essential strength and flexibility proper tie out of asphalt, leaving it brittle and full of hairline cracks that make the surface vulnerable to water invasion. Effects of Freeze-Thaw: Aggregate ravels from the surface and the pavement becomes rough. water penetration enlarges cracks and the freeze-tha cycles add to the breakdown. Gas & Oil: further deterioration occurs from gas and oil leaks that soften and pit the asphalt. Salt & Sand left uncleaned after the winter months wear down the surface course of the asphalt. No preventive measures: Asphalt that is not maintained will inevitably break down. Crack sealing, Sealcoating, Rejuvenating slow down this aging process and saves you money in the long run. A traditional method of patching would be to saw cut the edge or perimeter of the area being repaired. Depths are typically between 2-4 inches. Once saw cut, the area is then removed by backhoe or by hand depending on the size and scope of project. 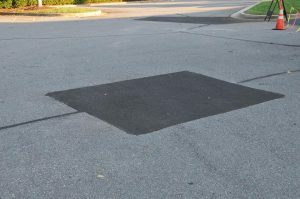 When the damaged asphalt is removed the area is cleaned of dirt and debris. A tack coat is then applied to the edge of the patch and throughout the patch area. New asphalt mix is then installed 2″ at a time depending on the depth of the repair. Once raked and graded, the new patch is then compacted with a multi-ton vibratory roller and or a vibratory plate depending on the patch location. The edge are then tack coated or crack sealed. Although a cheaper alternative, this is not an asphalt repair method we recommend. Putting good asphalt over bad asphalt is providing a band-aid repair. The problems you had before covering them with a surface patch are still there, only hidden for a short period of time. Reflective cracking is inevitable and the surface patch will eventually fall apart, usually leading to more expensive repairs up the road. Preventive maintenance is always going to be your best avenue to prevent costly asphalt repairs. When the time comes to do repairs, it pays to do them right. Asphalt Pavement Solutions provides you with 2 excellent choices, the traditional 2-4 inch remove & replace, or the Infrared Technology repair. Contact us! We at Asphalt Pavement Solutions are happy to provide pricing on all your asphalt repair needs in the Philadelphia/Camden areas and beyond.